Have I told you how much I love breakfast? Late breakfast – to be precise. Oh, but I guess I did told you about that matter in a previous post, the one with eggs in tomato nests. Well …anyway, you got the point, right? So, while still enjoying the winter holidays, I had indulged myself with this lovely, creamy, cheesy, beautifully colored omelette. I liked it so much, that I could eat one for lunch aswell, but then I reminded that tomorrow will be another late lovely morning, so I decided to wait. 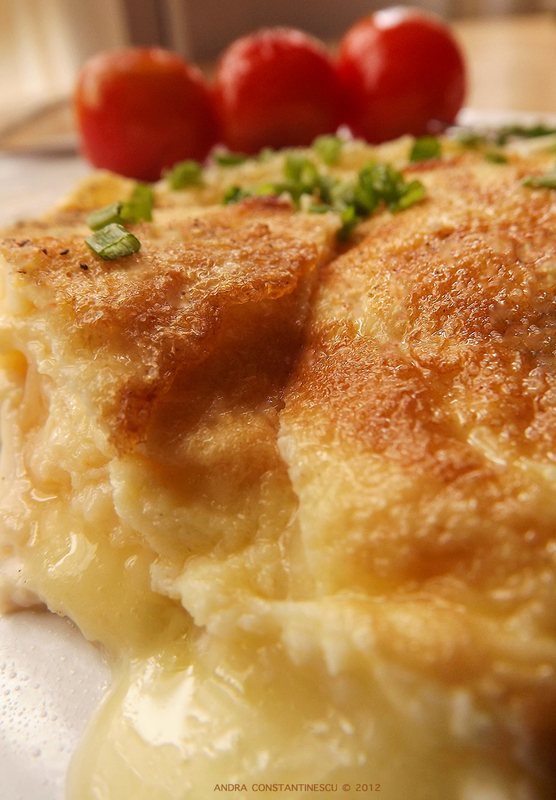 Until tomorrow then, here is the recipe for this creamy and indulgent omelette. Preheat a small non-stick pan on medium heath, and let the butter melt. Separately, beat the eggs in a small bowl and add a pinch of salt. When the butter is melted, gently add the eggs and allow them to cook slowly, using a wooden spoon or a spatula to push the eggs from the edges of the pan to the center. Add the french brie slices on the top and cover with a lid for about 2 minutes, until the eggs are done and the cheese starts to melt. Fold the omelette in half from the middle, let it cook for another minute and then remove the pan from the heath. To serve, just add some fresly ground black pepper and fresh chopped chives.